David Hockney’s “Portrait of an Artist” – A Bigger Splash – No you don’t have to spend $60-80 Million Dollars to own one. A poster that has never been used or displayed and may show the most minor signs of age and wear. The poster should have no holes or tears. A generally unused poster with fresh, saturated colors. May have minimal tears at folds. Has no significant holes, no paper loss, may have minor tears along edges, may have fine pin holes. A poster with bright colour and crisp overall appearance. It may have very general signs of use including slight fold separation and fold wear. It may have pin holes or very minor tears. This is the highest grade allowed for a poster that has been restored either on linen or on paper. A poster with good colors and overall clean appearance. It may have minor tears small paper loss and minor stains. It may have some fold seperation. An average poster with overall fresh color. May have tears, minor paper loss, minor hazing. Paper may be brittle due to age, may have minor stains. May have a small amount of writing in an unobtrusive place. May have medium or major restoration. A poster with faded colors and brittle paper, showing significant signs of use. May have tears and paper loss. May have tape, writing, stains in image area. In need of restoration or had major restoration. A poster that is worn, torn, and/or damaged. May have staining, cracking, dry rot, and/or large tears. May be heavily soiled, may have pieces missing. In need of major restoration. All photographs and images used on our site are photographs of the actual poster/item you are buying, we do not use stock photographs. 11 x 14" printed on heavy stock paper. Used as display in theatre lobbies. Originally made in sets of eight. Some sets have a title card, which contains credits and artwork, essentially a mini-poster. The remaining seven cards are coloured photographic credits and poster artwork showing different scenes from the movie. 14 x 22" printed on heavy stock paper with the top 4-6 inches usually left blank for the local cinema owner to fill in the cinema and the date it was due to play. Largely discontinued during the 1970's. 22 x 28" printed on heavy stock paper. The image displayed is normally a smaller version of the main poster, although some do have different artworks and sometimes come in two versions. 14 x 36" printed on heavy stock paper. Inserts usually have the same artwork as a one sheet. Popular with collectors since they are smaller and easier to frame. Normally come tri folded or rolled. 40 x 60" printed on heavy stock paper. Rare since they were primarily used for major motion pictures only. Designed to be used outside the theatre, on an easel, normally at a drive-in movie theatre. 27 x 41" printed on paper. This is the most common size of poster, intended to be displayed in a glass "marquee" case. It is the most sought after size by collectors. 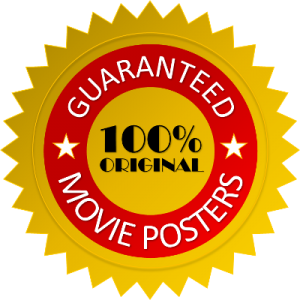 Since the 1980's most posters are sent to the theatre rolled and maybe slightly smaller measuring 27" by 40" and with the advent of backlit light boxes a growing number of modern movie posters are available double-sided and the more traditional single-sided. 41 x 81" printed on paper. These were printed on two or three separate sheets designed to overlap, few survive. Used for larger advertising spaces, normally posted on walls, perfect for huge movie theatres the drive-in, where people could see them from a distance. From the 1970's on, three-sheets were sometimes printed in one piece and issued as "international" versions to be used abroad. 30 x 40" Most common poster size used in the UK. British Quads are horizontal and may have different artwork to the US one sheet. Like a US one sheet they normally come in two versions. Like a US one sheet they are usually supplied single-sided or more commonly now as a double sided poster. 27 X 40", printed on paper. Very rarely used size. 13 x 28" six inches shorter than the US insert, very nice size to frame. Italian poster illustrators are some of the best in the industry. 18 x 26" Glossy, high quality, used as lobby cards in Italy. Size may vary, either vertical or horizontal format. There are also double Photobusta or mini Photobusta. (DUE): 39 x 55" This is the standard poster size used in Italy. Italian poster illustrators are some of the best in the industry. (QUATTRO) 55 x 79" Very large Italian poster printed in two pieces, often contains very beautiful artwork. 47 x 63" (GRANDE) or 24 x 33" (PETITE) French movie posters normally come with different artwork to either the US or the UK. Like the Italian's some of the artwork is extrememly beautiful.